The more they “fixed” it, the more it broke. 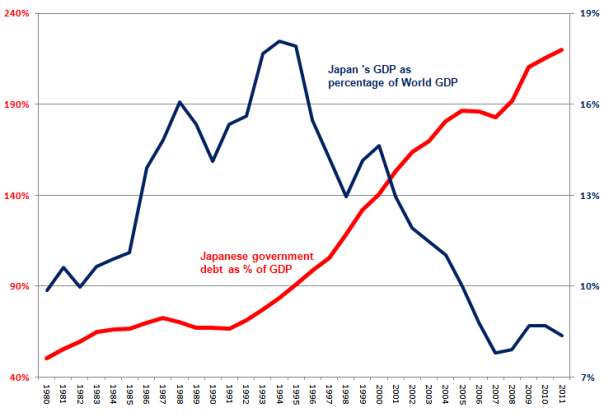 17 years later, the only thing Japan has proved is that smart Japanese economists are about as real as Godzilla. Time and time again, the country has chosen collapse over admitting failure. On November 19, 2012, Bloomberg reported, “The Japanese government will spend 1 trillion yen ($12.3B) on a second round of fiscal stimulus as it tries to revive an economy at risk of sliding into recession.” It would be funny if it wasn’t so tragic. Japan’s government has approved its second round of stimulus in a little more than a month, as prime minister Yoshihiko Noda tries to pep up a flagging economy in the run-up to December’s elections. On Friday the cabinet announced that it would tap reserve funds to spend Y880bn ($10.7bn) on a variety of measures, including rebuilding areas hit by the March 2011 earthquake, employment support and aid to cash-strapped small businesses. The plan is roughly double the size of a package announced in late October, which was also drawn mostly from reserves and aimed at reconstruction efforts. The stimulus comes as Japan hovers on the brink of a technical recession, its fifth of the past 15 years, as manufacturers cut production amid a steady worsening in their sales and profit outlook. Falling exports were the main contributor to a 0.9 per cent contraction in gross domestic product between July and September, and economists are braced for another in the three months to December. Last week the government slashed its quarterly assessment of business sentiment in all 11 regions of the country — the first clean sweep since February 2009 — blaming sluggish output and consumption. The BS meter just hit record highs! They don’t even have the foggiest idea where the corium is. TOKYO—Work to stabilize Japan’s tsunami-hit nuclear power plant is on track and the government plans to declare it stable by the end of the year as planned, the prime minister said Friday. Temperatures of the three melted reactor cores have fallen below the boiling point and radiation leaks have significantly subsided, Prime Minister Yoshihiko Noda said.